The March Update is here, it’s called “Agriculture & Sound design”. In this update, you’ll get to understand better how plants are evolving in the game. You now have small panels ingame and a better interface to show you what’s planted and when it will grow. You now have more than 20 sounds in the game that are creating a complete soundscape, and a natural ambiance which varies according to the season (and the zoom level!). We will be bringing a few more sounds and short musics with the next update as well. You can congratulate Antonin (programmer) & Jérôme (our sound designer) for their work on it! 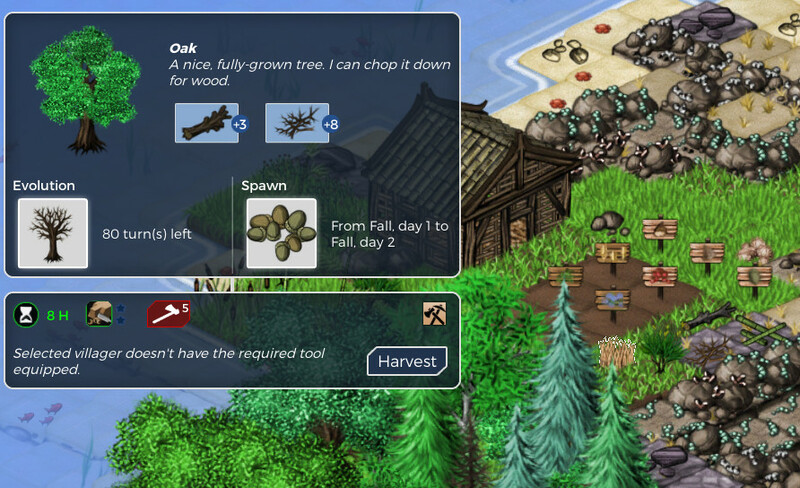 Players also get new buildings and items for the late game, including advanced workshops like a forge, a foundry, a sawmill… Existing content has been a bit modified for balancing, e.g. fishing rod has been replaced by a pronged spear (some kind of rudimentary harpoon) and planks are now made in the sawmill instead of the wood workshop.